Published: Oct. 15, 2017 at 02:25 p.m.
San Francisco 49ers cornerback Rashard Robinson intercepts Redskins QB Kirk Cousins on a deep pass downfield. 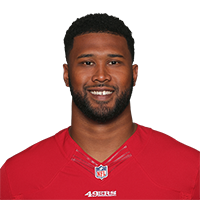 Published: Nov. 13, 2016 at 06:39 p.m.
On 2nd-and-goal, the San Francisco 49ers get a turnover as linebacker Eli Harold strips Cardinals QB Carson Palmer of the football. Published: Oct. 16, 2016 at 01:21 p.m.
San Francisco 49ers defensive end Arik Armstead while sacking Buffalo Bills quarterback Tyrod Taylor, forces fumble and recovers the ball.